In the days after 9/11, a Dallas man named Mark Stroman went on a revenge killing spree. Rais Bhuiyan survived and, a decade later, tried to stop Stroman’s execution. Rais Bhuiyan is blind in one eye. His left eye is strong, intense, with perfect vision. It will follow you through a conversation, registering even a subtle change in posture or facial expression. But his right eye, even after years of surgeries, will never be more than a sluggish ornament that he wears for the sake of symmetry. It’s a symbol of what was taken from him—of what he was left with. The eye sits off to the side a bit, picking up only shades of light. He has no depth perception or peripheral vision, making it difficult to walk across unfamiliar territory without bumping into things or to play soccer without embarrassing himself. He has had to train his mind to look through only his good eye. Now, though, he says he sees things he’s never seen before. He used to have 20/10 vision in both eyes, and he was a pilot in the Bangladeshi air force. That was before he came to America—to Texas—in pursuit of higher learning. Before a white supremacist lifted a shotgun to his face and blasted searing-hot pellets through his right pupil. Before his wife left him, he lost his job, and he became homeless and terrified to talk to strangers. Before years of operations—dozens of long needles inserted into his eye—and a decade of piecing his life back together. 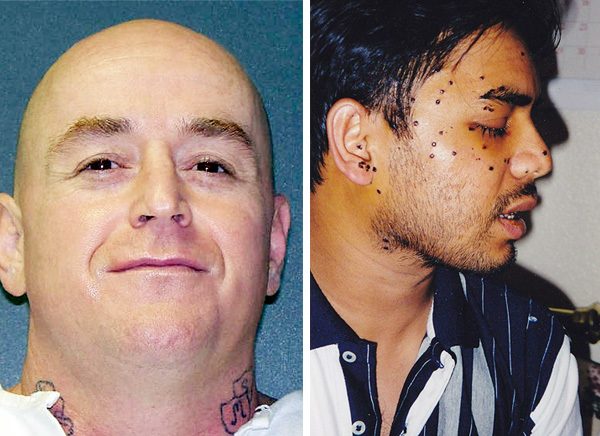 It was only after all of this that Rais Bhuiyan, the 5-foot-6 immigrant with a soft voice and one very focused eye, sued the state of Texas to stop the execution of the man who shot him. The first thing 27-year-old Rais Bhuiyan (pronounced Boo-yon) did when he got to the Texaco station every day was read the headlines in the Dallas Morning News. On September 17, 2001, he read something terrifying: a convenience store clerk had been shot and killed a few blocks away. Bhuiyan begged his boss, the owner of the station, to reinstall the security cameras—he’d already received a few tense glares in the days after 9/11—but money was tight. Bhuiyan had dreams in which customers suddenly pulled out guns and started shooting at him. He had been working at the station in Mesquite for only a few months and he’d already been robbed once. At the time, he thought the man was trying to sell him a handgun. “How much?” Bhuiyan asked when he saw the weapon. This wasn’t the America he’d hoped to find when he left his family, his new bride, and his promising career as an officer in the military. He came for the best education in the world. He’d moved to New York in 1999 and won a green card lottery the next year. In May 2001, he moved to Dallas, where a friend was opening a gas station. Everything seemed so much cheaper here than in New York, and the area had so many universities to choose from. He worked 13-hour days at the station, saving money for when he could bring his wife to America. Bhuiyan wasn’t supposed to be working the morning shift on September 21, 2001, but the only other employee had quit a few days earlier. It was raining giant droplets all morning and business was slow. Around 12:30, a man from the barbershop next door came in to buy a bag of chips and a drink. Not two minutes after he left, Bhuiyan looked out the window to see a white man with his face covered and something shiny and black in his hand. Mark Stroman was a 31-year-old meth addict and father of four. He had a web of neo-Nazi tattoos and a long criminal record that included a litany of robberies and assaults. His father raised him on hate, beating him anytime he refused a fight. His mother once told him she had been $50 short of aborting him. Stroman, who in addition to his red bandana was also wearing black sunglasses and a black baseball cap, didn’t touch the money. Instead, he asked a question in his thick Texas accent. All it took was hearing Rais Bhuiyan’s meek voice. The gun went off. At least 38 pellets hit Bhuiyan. One broke out a tooth. A few went through the bridge of his nose. Several pierced his cheek and forehead and his right ear. And one pellet went right through the center of his pitch-black pupil, stopping millimeters from his brain. But at the time, Bhuiyan wasn’t at all sure what had happened. He felt like he’d been stung by a million bees, all at once. But he was still standing. And two and a half feet away, so was Stroman. Maybe he didn’t shoot me, Bhuiyan thought. The loud bang sounded distant, like maybe it had come from outside. He looked down and noticed what appeared to be a faucet of blood leaking onto the floor. Then he knew. As he heard the front door swing closed, Bhuiyan was already pleading with God. Please! he thought. Don’t let me die. He stood up and ran to the barbershop next door. As he entered, the men looked like they’d seen a monster. They tripped over themselves to get away from him. In the barbershop mirror, he caught a glimpse of himself. He could see the blood running down his face, saturating his favorite olive t-shirt and his new tennis shoes—the clothes he’d purchased in an effort to look more like young people in America. Is that really me? He’d been one person only seconds earlier. Now it appeared he was someone else entirely. He spoke aloud the words he had, until then, only been thinking. “Please!” he pleaded. “I’m dying! Please, don’t let me die.” Someone called 911. Bhuiyan ran toward the ambulance in the parking lot. He took off his own t-shirt. “Please!” As they put him on the stretcher, he felt himself getting faint. At the hospital, he could feel his eyes forced shut by the swelling. He wondered if this is what it felt like to have life slowly escape. He could hear the voices of doctors and nurses and police officers. After the shooting, he stayed conscious for nearly four hours, mostly by sheer willpower. Then: he was gone. When he awoke the next morning, he heard the warm, comforting voice of a woman. Bhuiyan couldn’t tell what she was saying, but hearing her made him feel safe. He wondered if she was an angel. Then the voice sounded closer. He couldn’t open his eyes or move his jaw. But he could feel his own tears begin to pour over his swollen cheeks. In that moment, life felt so precious. He was happy—more than happy, grateful—to be alive, to still be part of this world. Within a few hours, he could open his left eye, and he asked for a mirror. What he saw horrified him. His cheek was twice its normal size, covered in dried blood, and peppered with pocks. His right eye popped out of his skull like a baked potato. This time when he wept, he did not cry tears of joy. The nurses explained that none of the pellets had penetrated his brain. They called him “a lucky boy.” The first few hours, like the first few years, would be filled with a series of emotional crests and valleys. He was released a day later, but he’d soon learn his troubles were just beginning. After getting shot, he couldn’t work. He had been living with his boss, who continued to host him for a month after the shooting. But soon the relationship grew strained. Bhuiyan, feeling he’d overstayed his welcome, started sleeping on a friend’s couch. Before long, he felt guilty there, too. He went from friend to friend, appreciating the hospitality but never wanting to be a burden. It was around then that his wife back in Bangladesh decided she couldn’t take it anymore. Her parents had always preferred she marry another man, pressuring her day and night. Before he moved to the United States, Bhuiyan and his longtime love filed for a marriage certificate without telling their families. Now that he was gone and shot and unable to provide any kind of future, she couldn’t wait any longer. He couldn’t ask her to. The police and the Dallas County District Attorney’s Office found Bhuiyan and took a number of statements. He remembers the prosecutor telling him not to have any contact at all with the defendant, Mark Stroman. Soon Stroman went to trial. It wasn’t for the attack on Bhuiyan. Nor was it for the shooting of Waqar Hasan, a 46-year-old Pakistani immigrant, the crime Bhuiyan had read about in the newspaper a few days before his own encounter. Stroman was tried for the murder of 49-year-old Vasudev Patel, another gas station attendant shot with a .44 caliber pistol, whose killing was caught on tape. In his hunt, Stroman shot exactly zero Arabs. Patel was an Indian Buddhist. Stroman’s was the first case brought under the state’s new hate crime legislation—a reaction, in part, to the horrific dragging-death murder of James Byrd in Jasper. In court, Stroman was unrepentant, making obscene gestures at the victims’ families, claiming his rampage was revenge for a sister killed in the World Trade Center—though there is no evidence said sister ever existed. Stroman’s trial was over quickly. The prosecutor asked Bhuiyan to testify at the sentencing, to tell the harrowing tale of the attack he survived. That, too, was over quickly. After a short deliberation, the jury sentenced Mark Stroman to death. Bhuiyan fell into a deep depression. alone, his life knocked from perfectly laid tracks, he felt a constant dread, a perpetual sinking in his chest. He was uncomfortable with strangers, uneasy in public, always concerned—however irrationally—that anyone might attack at anytime. He had recurring nightmares. He worried that anytime he went to sleep he’d spend another night staring at Mark Stroman’s eyes or that double-barrel shotgun. He’d wake up grabbing his face in a panic, convinced he’d been shot all over again. One of the few public places he would go was his doctor’s office. Month after month he’d go back for new procedures, new tests, another giant syringe hovering over his eye. With no money to pay for the surgeries or expensive medication, he begged for drug samples. His doctor told him about the victim compensation fund, through which crime victims in Texas could have some medical bills and living expenses paid by the state. He knew he wanted some semblance of a life again. He knew he needed to work, to interact with the outside world. A friend got him a job at Olive Garden. He thought he’d be washing dishes, but the manager—an older Pakistani man who felt bad for the wounded immigrant—thought Bhuiyan seemed smart enough to be a server. Bhuiyan agreed to try it for two weeks. He found that when he was memorizing orders and studying the way people interacted, he wasn’t nervous anymore. He felt like a student, comfortable with the knowledge he was once again building toward the future. Soon, he was getting compliments from customers. He quickly became one of the best waiters at the restaurant, always near the top in tips and alcohol sales, even though he doesn’t drink. But one day he felt the panic return. There was a table full of people who looked like Mark Stroman. They had the same shaved heads and tattoos that looked like his. Some had piercings through their lips and noses. Bhuiyan couldn’t shake the notion that they could be Stroman’s friends or even his family. That they were there to finish him off. His manager found him hiding, crying in the kitchen. “I can’t go out there,” Bhuiyan said, his face buried in his hands. “Come with me,” his manager said. The manager walked him over to the table. He introduced Bhuiyan and made a joke about them being twins. When Bhuiyan looked up, he didn’t see the sneers he expected. Instead, he saw smiles. After he took their drink order, they made small talk. He asked them about their tattoos. They weren’t racist scrawls, it turned out, and each had an interesting back story. They are people, he thought. Just like me. They needed to be fed. They needed to be cared for. Slowly his life improved. He started taking college classes again. He got a degree, and, after three years at Olive Garden, a new job—making a six-figure salary working on global IT for a travel company. He felt blessed. But he didn’t feel peace. When he was first shot, with blood pouring from his face, praying to God, he promised that if he was allowed to live, he’d dedicate his life to helping people. He’d make his life on this planet meaningful. He worried he hadn’t kept his promise. In November 2009, he took a trip to Mecca with his mother. It was a Hajj, a pilgrimage. They stayed for a month, praying almost all day every day, purifying. In the quiet time, he sat and thought about his life, the chance encounter all those years ago, and the man who had taken his eye. Rais Bhuiyan felt his heart soften; he felt the pouring forth of something warm, something invigorating. He felt something leaving his body. He felt forgiveness. What had been pure fear, pent up for years, was now compassion. He didn’t hate Mark Stroman. He pitied him. Thinking of this man sitting in a prison cell, counting down the days he has left on this planet, he wondered if he could help him in some way. He remembered what the prosecutor had told him, and he didn’t want to break the law, but Bhuiyan wanted to talk with the man. He wanted to tell the monster haunting his dreams that he had forgiven him. Mark Stroman’s execution date was set in March. He would die at 6 pm, on July 20, 2011. If the state tried to contact Rais Bhuiyan, as it claims in legal documents, the attempts were unsuccessful. Bhuiyan didn’t hear about the execution date until he talked to a human rights professor at SMU in March. He wasn’t thrilled. It was now something he thought about a lot. The professor told him about “victim-offender mediation”—when the victims of violent crimes get to meet with their attackers in a safe, therapist-mediated setting. In Texas, Bhuiyan learned, this was his legislated right. He contacted Mark Stroman’s attorney, Lydia Brandt, who was filing for clemency at the time. He said he wanted to set up a meeting with Stroman. She said she thought her client would consent and that she would look for a mediator. Three weeks later, she told Bhuiyan his best option was to go through the Victim Services Division of the Texas Department of Criminal Justice, which has an entire victim mediation program that includes weeks of preparatory counseling for both parties. He made a phone call to the TDCJ. Then another. Then another. He tried the District Attorney’s Office, too—he was told they couldn’t help him. Weeks went by, and he never got a straight answer. Until the first week of July, when he sent a fax to the TDCJ. He got a call, then an email. There wasn’t enough time to set up a victim mediation session, he was told. Once there’s an execution date set in Texas, that’s that. Bhuiyan wanted to complain. And in this country, there is no better way to complain about something than a lawsuit. He asked Brandt to represent him. She explained the legal concept “conflict of interest.” So he started searching online. He decided he wanted someone with an Islamic background, someone who would immediately understand his desire to make his heart whole again. He found Khurrum Wahid. Something of a Muslim Johnnie Cochran, Wahid is calm, frank, and media friendly. He’s been involved in several high-profile terrorism-related cases in the United States over the last 10 years and has a lucrative practice based in Miami. Bhuiyan sent Wahid a message, asking for legal advice. Wahid replied right away. He’d take the case pro bono. Wahid immediately enlisted the help of a Houston-based anti-death penalty group called GRACE. Its dedication to working on behalf of poor, mostly minority men convicted of heinous crimes had recently earned the group a profile in The New Yorker. (The executive director of GRACE, Danalynn Recer, is married to a longtime friend of Wahid’s from his time as a public defender.) One day later—with only a week to go until the scheduled execution—they filed a lawsuit against the State of Texas, against the state attorney general’s office, and against Governor Rick Perry, who had the power to postpone or commute the execution order at anytime. Because the filing claimed, among other things, that the state was violating Bhuiyan’s civil rights, the case was bounced to federal court. The hearing to determine jurisdiction—whether the court could even decide if this rather special situation necessitated a stay—was set for 10 am in Austin on July 20, the day Stroman was scheduled to die two and a half hours away in Huntsville. The night before, Bhuiyan and his legal team—both attorneys, an investigator brought in from London, and two legal interns—gathered at a Thai restaurant a few blocks from the University of Texas campus. Danalynn Recer, who speaks in a steep Texas twang, got her BA, her master’s, and her law degree from UT, and she was talking about how much Austin has changed in just the last few years: new buildings, expensive high-rises, that sort of thing. Bhuiyan ordered shrimp fried rice and a Thai tea. When it came, someone noted that the drink was “death-row-jumpsuit orange,” and there was an uneasy laugh. Wahid was discussing the case. “Texas has a very clearly defined statute outlining a victim’s rights,” he said. “Yes, this place has a reputation for executing a lot of people, but it’s one of the few states that cares enough about the victims of violent crimes to write their rights into the Constitution.” What this case does, he explained, is put in opposition the state’s desire to care for the needs of victims and its desire to kill people. The morning of July 20 was hectic. Bhuiyan woke up at 5 am—13 hours until the execution time. He had more interviews, including one with a reporter who came all the way from Japan. By 9:30, the group collected in the La Quinta lobby. In addition to the legal team, Bhuiyan was joined by a gray-haired woman with glasses and a prominent gold cross hanging from her neck. When she heard the story of the man suing to stop the execution of his shooter, Paula Kurland came in from Houston. Kurland’s 21-year-old daughter, Mitzi, and her roommate had been stabbed to death by Jonathan Nobles in 1986. Kurland met with Nobles on death row 12 years later; it was one of the cases that led to the passage of strong victim rights laws in Texas. She expected the meeting—she insists that it’s not a “confrontation,” that it’s a “mediation”—to consist of 30 seconds of her yelling, then her walking out the door. Instead, it turned into five hours of meaningful discourse about the crime, about the impact on her family, and about God. Two weeks later, Nobles was executed.